Yes, I’ve decided that fans of Maniacal Labs are hereby dubbed Igor, regardless of gender (I suppose female Igors might want to be referred to as Igorina, but I will allow them to petition for this at a later date [Fans of the great Sir Terry Pratchett, REJOICE!]). The other maniacs and I have decided to do some reviews of modelling software that is available as freeware out there on the internet tubes. We’ll be using each of them to do a small project or two and giving our opinions on them, plus any silly puns we feel like adding in. First into the gates is AutoDesk’s 123D Design application on an iPad. I believe it requires at least iOS 6 to run, making it unavailable on first generation iPads. I used a 3rd gen iPad for my project. I am a huge fan of board games, but the boxes always frustrate me. 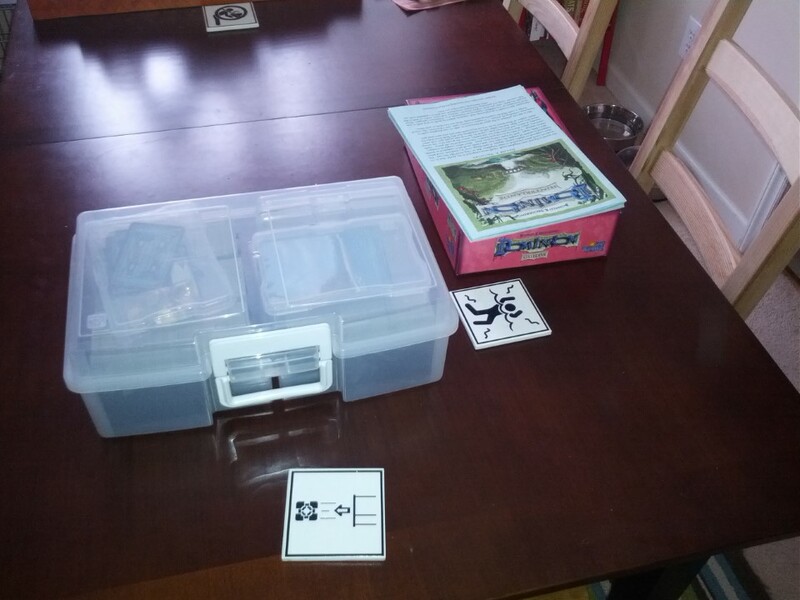 As a whole, it seems that the manufacturers want a game to have a big, eye catching box to make it more noticeable, but when you open up a huge box, most of the space is taken up by a cheap vacuum formed plastic insert. Some of these games take up huge amounts of space, especially when you add in games with multiple expansions. Like Dominion. Have you heard of Dominion? It is a card based, deck building game with many additions to the base game. And I own all of them currently available. After getting tired of carting around several cubic feet of what was mostly empty boxes, I found a tutorial on how to fit all the different cards from the different expansions into one box. Originally, I did this, but the box was heavy and I worried about it breaking and making a huge mess. 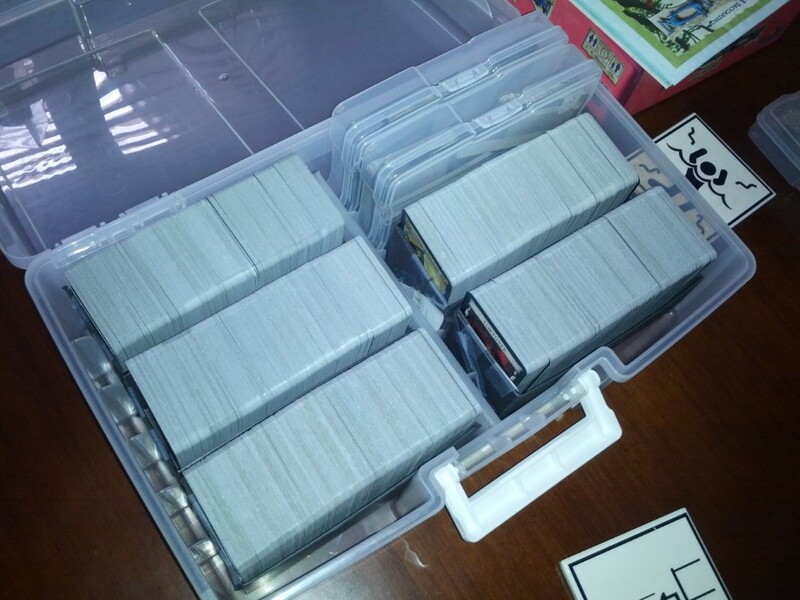 Later, I got a plastic photo storage box, and followed this tutorial, making the boxes out of heavy duty card stock. 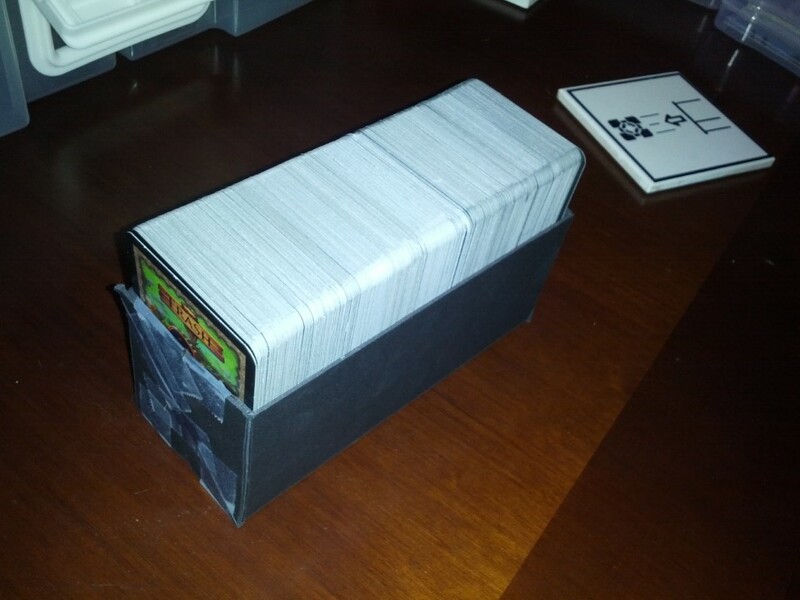 I’ve never been happy with the home made card stock boxes - it’s hard to get them out, the cards don’t fit well, cards easily get stuck in the bottom. So I decided to see about modelling a new box, to run 123D Design on my iPad through it’s paces. 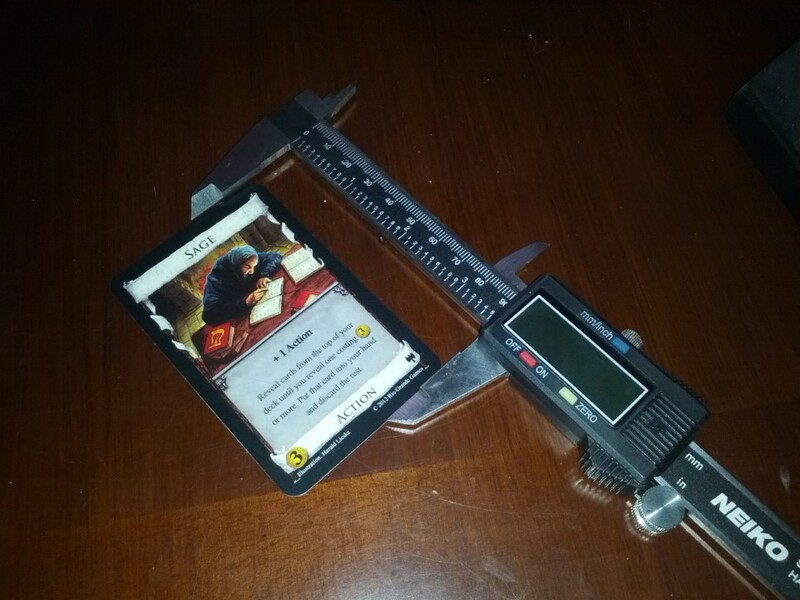 The first thing I needed to do was measure the cards, to make sure I had enough width for them to fit correctly. Also, I needed to measure the small holder box, so it would fit into the large overall box. 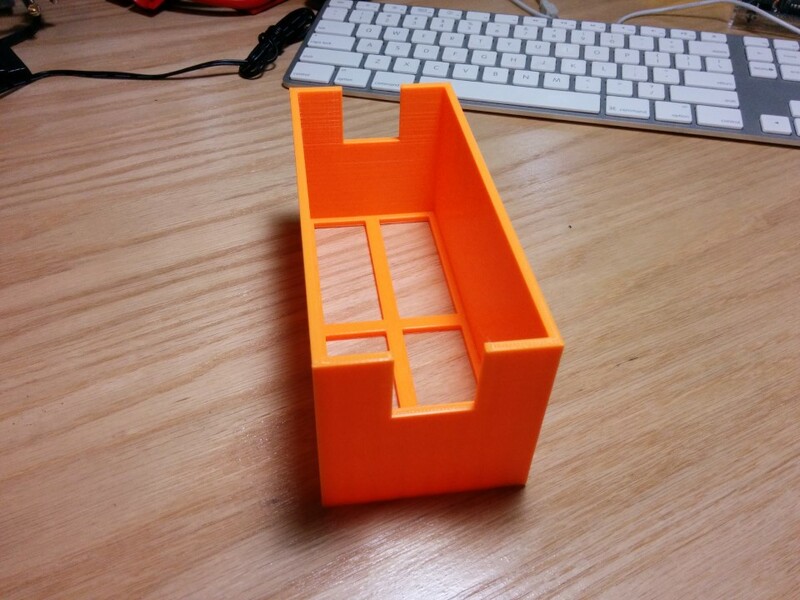 All in, the box would need to be 2.75” square on the end and 6.25” long with 1⁄8” thick walls. I wanted some holes in the bottom to unstick fallen cards too. Digital Calipers make measuring easy! The app was relatively easy to use. The icons for functions were easy to read and symbolized what they did. Like, the align function showed two different rectangles side by side, each with one edge lined up with the other and a line emphasizing this. Most of the functions are pretty self explanatory as to what they did. Between a little bit of trial and error and the help function, it’s pretty easy to figure things out. The free version of the app requires you to register, and gives you some cloud storage space to upload your models. Mine can be found here. Portability! You can model stuff while watching TV! Commuting! Sitting on the toilet! Wherever! The camera is a bit on the clunky side. Especially when you move it with your fingers, using pinches and swipes. There’s also no way to easily orient it to a view (like front, back, left, etc.) In other Autodesk programs, there is a ViewCube that lets you do this, and it should have been included in this. Void forms are a tricky in this. Once you use the cut function, you cannot go back and change it. No take backs. This can be very frustrating when you want to move a hole in a model up half an inch, because you measured something wrong. Strike that. Not frustrating, infuriating. The iPad app seems to be more of a support tool for the desktop version. It seems to rely on the portability of it to make up for some of the strangeness of the controls. I think it would be best used in a meeting or similar to show a model to someone else, instead of building something from scratch. When I review the desktop application, I’ll see how easy it is to change stuff between the two clients.